How Scary Is the Horror Movie Hereditary With Toni Collette? How Scary Is Hereditary, This Year’s Big Sundance Horror Movie? Photo: Courtesy of Sundance Institute. Remember that moment near the end of The Sixth Sense where Haley Joel Osment finally reveals his special, spectral gift to his mother Toni Collette, and her face goes through a tremendous series of emotions? First, Collette narrows her eyes in anger — she can barely believe the nerve of her son to make something like this up — and then, as Osment mentions things that simply can’t be explained away, her face goes slack with shock. Suddenly, the tears start to come, seeming to surprise even her, and by the end of the scene, Collette is both a believer and an emotional wreck. It’s an astounding sequence that won her an Oscar nomination and announced Collette as a major talent. Imagine that scene drawn out to two hours, and you’ll have some idea of the wringer Collette goes through in Hereditary, the new horror movie that has everyone at the Sundance Film Festival buzzing. Though the festival is better known for searing dramas, quirky comedies, and dozens of coming-of-age stories, Sundance has also produced its fair share of horror hits like The Babadook and The Witch, and Hereditary has been anointed as this year’s big scaremonger. The film premiered earlier this week as a midnight entry and everyone I talked to claimed to be scared out of their wits. Today, I finally caught up with Hereditary, and the thing that surprised me the most is that for nearly half of its running time, it’s not quite a horror movie at all. Don’t get me wrong: For that first hour of Hereditary, you’ll still be unnerved, but it plays closer to one of those Sundance family dramas we see here so often, with only the occasional clues that something is amiss. When we meet Collette’s character Ellen, she’s trying to keep things together after the death of her mother. The two didn’t get along at all — frankly, both Ellen and her husband Steve (Gabriel Byrne) seem glad to be rid of the old woman — but her absence sets off a chain reaction of events that leave her family in dire straits. Youngest daughter Charlie (Milly Shapiro, who’s blessed with one of those perfect horror-movie faces where you can’t tell if the kid is 8 or 82) is increasingly withdrawn after Grandma’s death, Ellen finds it hard to concentrate on the large-scale miniatures she makes as an artist, and son Peter (Alex Wolff) unwittingly sets off a second tragedy that further tests his family’s inability to heal. All the while, weird little clues are dropped about the movie’s true nature. Ellen reads a note from her late mother teasing that her “sacrifice will pale next to the rewards,” then must contend with a support-group member (Ann Dowd) who’s a little too willing to help Ellen with her grief. First-time feature director Ari Aster shoots Ellen’s house with the sort of framing that just inspires dread, even though nothing overtly monstrous is going down. And then there’s Charlie, who is becoming a little sociopath: When a bird kills itself by smashing into the window of her classroom, Charlie hustles outside during recess, snips off its head, and carries it around as a souvenir. In many ways, this is the film’s best portion. You can sense a trap is being constructed, but you can’t quite predict when it will spring shut and maul you. Is Hereditary a ghost story? Will Grandma, whose grave has been robbed, reappear as a zombie? The real form of the movie seems eternally out of reach, and the suspense is delicious. I was tensely perched in my seat the entire time, ready to pick fight or flight just as soon as I could figure out what the threat was. Once Hereditary finally shows its cards, Aster goes full-throttle and serves up some memorably scary images and unnerving sound motifs that had the audience yelping. The back half is where Collette really pulls the stops out, and it’s a pleasure to watch her get such a full-fledged leading-actress showcase, even though the poor woman goes through hell. 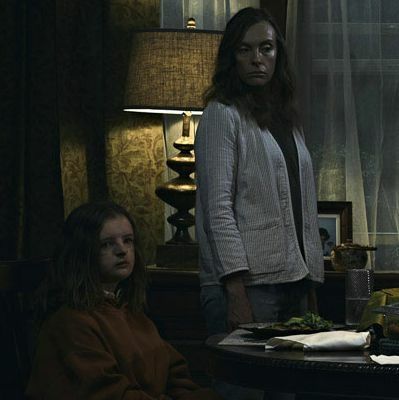 And I admired that Hereditary largely eschews those horror-movie tropes of the jump scare and the sudden, shrieking score to telegraph its scariest moments. Aster is interested in smarter ways to scare you and after he’s spent so much time getting you invested in this family, just about anything that happens to them will hurt. At the same time, though, I found myself missing the free-floating fear of the movie’s first half. Once all the clues pay off, the plot locks into place, and you can figure out the other movies Aster is borrowing from, Hereditary remains scary but becomes familiar. That’s fine for as far as it goes, and Aster is so confident that I can’t wait to see what he does next, but Hereditary’s braver first half is proof positive: For all the shocks a horror movie can muster, there’s nothing scarier than the fear of the unknown. How Scary Is Hereditary, This Year’s Horror Hit at Sundance?